« What Did Vitter Do That Was So Wrong? Chapel Hill — Authorities disarmed a suspicious package addressed to Democratic presidential candidate John Edwards on Thursday after the discovery of the package forced the evacuation of numerous businesses Thursday. The incident marked the third time in recent months that authorities have responded to mail addressed to Edwards’ office. A FedEx envelope from out of state arrived in the mail at about 10 a.m. Thursday, and intermittent beeping could be heard from inside, police said. And, being that huge believer in the GWoT being nothing but a bumper sticker, the Edwards campaign obviously called the police. The Durham County Sheriff’s Office bomb squad was called in to assist in the investigation. Bomb squad members determined the package didn’t pose a threat, but they used a high-powered water jet to disarm it. "What they found were four watches that were beeping at about three-minute intervals," Interim Chapel Hill Police Chief Brian Curran said. "There was also some literature in there." It was later determined that the package contained between two and four wristwatches and some literature, police said. The FBI planned to examine the literature as part of its investigation, authorities said. Of course, the Edwards campaign will blame this on some sort of right winger group. But, sure looks like they had a bit of a hissy fit over the package, eh? Postal employees in Chapel Hill intercepted another suspicious package in May after finding the letter contained a powdery substance. Edwards staffers also evacuated their office in Chapel Hill in March after an employee opened a package that contained a powdery substance and what Edwards later deemed "negative comments." Both packages tested negative for anthrax, the powdery substance that accompanied letters in 2001 that killed five people and sickened 17 others. Those letters were also mailed to lawmakers on Capitol Hill and members of the news media just weeks after the Sept. 11, 2001, terrorist attacks. 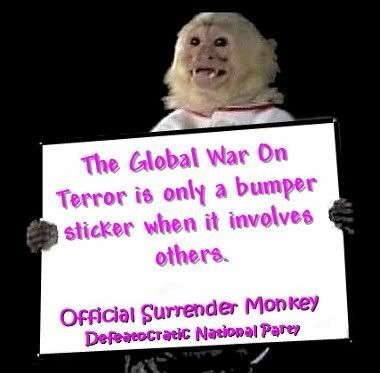 Yes, it does look like Edwards doesn’t think the GWoT is a bumper sticker when it is happening to him, eh? But, I am sure that Edwards will have a pithy bumper sticker slogan for what happened to him. Maybe "Two America’s: Those Who Get Attacked and Those That Don’t." More: Hot Air has the video I couldn’t yank off the web. New laptop. Vista hates WM Recorder. Send a trackback to this post, but don’t forget to link it. Otherwise, you may be attacked by John Edwards hair. This entry was written by William Teach and posted on at 7:38 am and filed under Surrender Monkey Friday. Bookmark the permalink. Follow any comments here with the RSS feed for this post. He will be the next author to pen a James Bond novel…. Police patrolling the Seattle club district shortly after closing time discovered an unusual scene – one some might consider wildly out of place in the environmentally-friendly Seattle area. Three news stories yesterday seem linked. Find out why Obama positioned himself in alignment with the rotation of the earth…. Many years ago in a quiet little blues village called Clarksdale in the land of Mississippi, a child was born on this day that Thomas and Cecelia named Carl. Today’s winner is Express Jet…. Attending one of these is kinna jugglin chainsaws on a motorcycle.